There is something so delicious about watching artists at work who have mastered their craft enough to disregard public opinion and create something exquisitely weird. 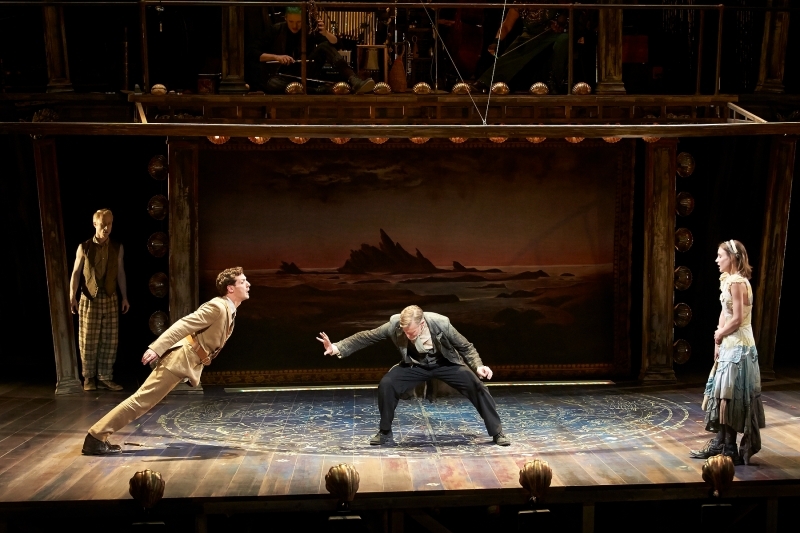 American Repertory Theatre’s staging of the Tempest feels like a transcendent late-night jam session between William Shakespeare, veteran magician Teller, and musical sabotage specialists Tom Waits and Kathleen Brennan. You could picture this production being a traveling troupe’s one-shot staging done during a layover, and someone happened to hit the record button on an iPhone. You can run, but you can’t hide from the Bard’s shadow, and holding his prose underwater until they stop thrashing around will only get you so far. Instead, Teller and co-conspirator Aaron Posner treat the source material with a creepy and improvisatory reverence. The stage appears thrown together, as does the action, even though it has been handcrafted in small batches. The production does well to not take itself too seriously by keeping with the motif of a magic show. From it, we can learn that the text is filled with both undeniable poetry and low-rent sleight of hand. Perhaps the production’s greatest strength is that it helps bring out the “devil-may-care” attitude of Shakespeare’s script. The Tempest is his (or their….whatever) last theatrical work, and it unfolds like a collective sigh after the heightened mania and earth-shattering glory of Shakespeare’s other works. The threadworn plot, of an exiled royal who uses magic to draw his enemies into revenge on an isolated island, would seem as fresh as a B-sides collection of a band, post-break-up, were it not for the wisdom on display. After years of killing off countless characters to try and find a way to transcend the human condition, Shakespeare has learned in the end that all we can do is forgive. It is a beautiful and desolate theme. The cast often is thrust more in the role of performers than actors, which makes it hard to judge them as “thespians”. On the flip side, it frees them up from the burden of the Shakespearean legacy. Tom Nelis, looking like a strange offspring of the comic book hero Wolverine and sitcom character actor Alan Thicke, makes the most of this space to haunt the stage. His lines drip with vibrato, and Prospero in many way seems distractedly transfixed by the spectacle he himself controls. Nate Dendy as Ariel, Prospero’s spirit servant, infuses the production with magic and grounds it with heart. And although they have little in terms of character depth to work with, Zachary Eisenstat and Manelich Minniefee captive us playing the twin bodies of Caliban, a terrible wretch of a creature enslaved by Prospero. They tumble and twist and speak as one, leaving everyone on stage wonderfully off-balance. The music of Waits and Brennan keep the purposely irregular pulse of the show by providing music that comes close to being familiar, but veers away into something ragged and profound. The songs are filled with lies and truths and irregularities, much like the action on stage, and much like everything we think we have ever learned about life. There were people playing a song which repeated the words “everything you see is true” before the really scary part. Ariel pretended to have this man drown and the man was struggling and then he collapses. They played ‘’everything you see is true“ after the really scary part. But the rest of the play was good, and I liked it. Added by The Queen: This is yet another A.R.T. production comprised largely by actors from the NYC area. For a company that claims to serve its community, the A.R.T. is remiss in serving the creative community of the Boston/Cambridge area. This entry was posted in Shakespeare and tagged "everything you see is true", 2014, Aaron Posner, Alan Thicke, AmRep, art, Cambridge, Clara Idlebrook, Craig Idlebrook, Johnny Thompson, June, Kathleen Brennan, MA, Manelich Minniefee, Matt Kent, May, Nate Dendy, Pilobolus, Shaina Taub, Shakespeare, Teller, The American Repertory Theatre, The Tempest, Thom Rubino, Tom Nelis, Tom Waits, Waits and Brennan, Wolverine, Zachary Eisenstat by craigidlebrook. Bookmark the permalink.